Ikaika Malloe, a former UW defensive back and graduate assistant who was caught up in one of the biggest scandals in program history involving Rick Neuheisel, is back with the Huskies as a defensive line coach. “Bones,” they called him back then, a skeleton of a boy growing up in football-obsessed Hawaii. 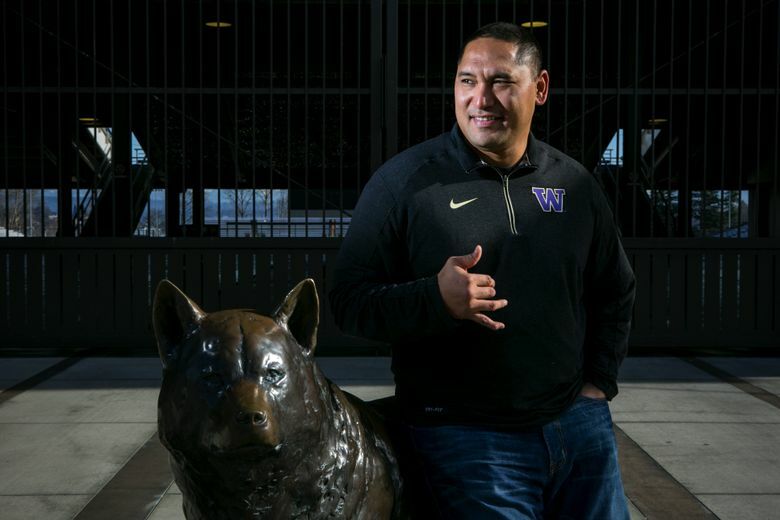 These days, the 41-year-old Malloe is built a little more like the defensive linemen he will begin coaching at his alma mater for the first time Monday morning when the Washington Huskies begin spring practices. Hired in December, Malloe (pronounced ma-LOY) is thrilled to be back in Seattle, reunited with old friends, eager to help the Huskies get back to the heights that he was part of as a player. Notable: Played defensive back for four years for the Huskies. ... Has worked as an assistant at Western Illinois, UTEP, Hawaii, Yale and Portland State. 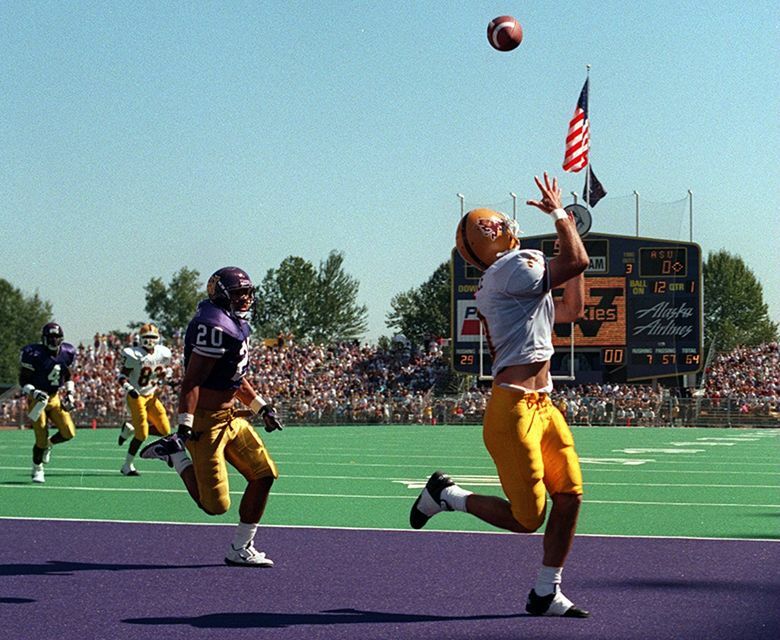 Before he gets the chance to bark out coaching commands at Husky Stadium, and even before he became one of the most feared hitters on the Huskies’ vaunted defenses in the mid-1990s, Malloe first was a punter. A puny junior-varsity punter. Back then, Malloe was engrossed in football the way a worm is to dirt. He loved the game. In Pop Warner, he was deemed too small to play, but the coach — who just happened to be his dad, and his hero — would sneak the skinny boy onto the field anyway. By the time Malloe got to Kamehameha High School, though, his size held him back. As a sophomore, he was not only stuck on the JV squad but he was only allowed to punt. So frustrated was he one Friday night that he went home defeated, broken down. He turned to his dad, Kimo. Malloe can still picture the setting that night in the family’s Waimanalo home, still picture the words coming out of his dad’s mouth. The message shaped the skinny boy, who would (finally) grow … and grow into a varsity star the next two years. It carried him through four varsity letters at UW, and it’s continued to carry him through seven stops in a winding 14-year coaching career. “I’ve lived by that ever since,” he said. Hustle and intensity best define Malloe’s journey as a player and a coach. But there have been missteps along the way, and he’s glad to talk about them. Those shaped him, too. After his senior season with the Huskies in 1996, Malloe stayed on with the program in support-staff roles, sticking through the coaching change that brought Rick Neuheisel to UW. He was a graduate assistant coach on the 2000 Rose Bowl team. Two years later, he was caught up in one of the biggest scandals in program history. Yes, Malloe told NCAA investigators in 2003, after he had left UW, he had organized office pools for the NCAA basketball tournament the two previous years. But he admitted so only after first telling investigators that he hadn’t organized the pools, an attempt, he says now, to protect other coaches in the program. April 23: Spring preview, 12:30-2:30 p.m. Schedule: The Huskies will practice Monday, Wednesday, Friday and Saturday each week, except for the final week, when they’ll skip the Friday practice in anticipation of the spring preview. Note: All practices are at Husky Stadium and are closed to the public. The spring preview is open to the public and has free admission. It was a dark, messy period. Neuheisel was, of course, fired during the ordeal. The Pac-10 investigated, and though only “minor” infractions were levied on UW, the whole episode played no small part in the program’s steep downward spiral through the rest of the 2000s. For his bit role in that, Malloe isn’t hiding. UW coach Chris Petersen said he did “due diligence” on Malloe’s background before hiring him in December. “We feel very strongly in him as a person and a coach,” Petersen said. The scandal, Malloe said, made him reflect on his personal and professional morals. “Really step back and learn the values I had when I was here as a player. Because I thought we did it the right way back then,” he said. He’s tried to use those lessons in a positive way as he’s built his coaching career. He was wearing the opponents’ colors, the blue and gray of Utah State, but when Malloe walked into Husky Stadium last September, he couldn’t help but feel a sense of pride. It was his first time back since the stadium’s reconstruction — and first time back on the grounds in about 14 years. “It was tough to be professional about it and not get excited about my alma mater,” said Malloe, the defensive line coach at Utah State the past two seasons. The Huskies defeated Utah State 31-17 on Sept. 19. A few months later, Malloe flew back to interview for UW’s defensive line job — vacated when Jeff Choate took over as the head coach at Montana State — and met Peter­sen for the first time. The friends have enjoyed reminiscing about their playing days. Back then, Malloe was the team’s best special-teams player, a mellow guy off the field but intense on it, said Nigel Burton, a fellow defensive back. Even then, Burton recalled, younger teammates would gravitate toward Malloe, who in 1993 won the team’s Bob Jarvis Most Inspirational Walk-on Award. He was the defense’s scout-team player during the 1992 Rose Bowl season. He later earned a scholarship and became a starting safety. Burton hired Malloe as Portland State’s defensive line coach and special-teams coordinator in 2012. “I wanted someone smart, passionate … and someone I could trust,” Burton said. He appreciated the intensity Malloe again brought to special teams. That meant being over-eager and ever-aggressive, never letting anyone outhustle him, as Dad said. It gave him an edge, and it opened a door for him at UW back then … and again.